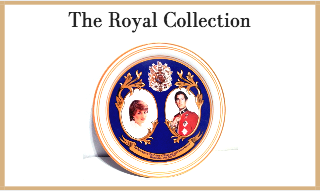 The Royal Collection was founded by the Queen and features official Royal gifts and commemorative souvenirs commissioned by Buckingham Palace. HRH has sourced historical Royal memorabilia from the British Royalty, in addition to featuring collectibles from Princess Diana of Wales and Prince Charles’ wedding, to our modern day Duchess of Cambridge, Kate Middleton. Authenticated Made in Britain pieces include Buckingham Palace trio sets, Commemoration cups, collectibles from Windsor Castle and miniature Royal gold carriage and horses – a piece of Royal British history. The HRH Collection continues with a select range of 19th Century Limoges porcelain from the former Limousin region in France. With its distinctive Regal cobalt blue and gold gilt enamel, exquisite pieces include miniature trinket boxes, gold swans, a music box and vases. With an enduring respectful nod to the monarchy and for the piece that no member of the Russian aristocracy would be without, HRH features an elaborate and highly decorated Samovar from the early Victorian period – prized for its intricate workmanship.